We spent two nights in Las Vegas as part of a week-long trip to Zion National Park and Bryce Canyon because it has the closest airport in the area. Checking out the over-the-top glitz of Vegas can be a fun way to start and end a week of intense hiking and natural beauty. And while Vegas is decidedly adult-oriented, there are activities that kids can enjoy as well. Just make sure they know that the "what happens in Vegas, stays in Vegas" rules don't necessarily apply to them! 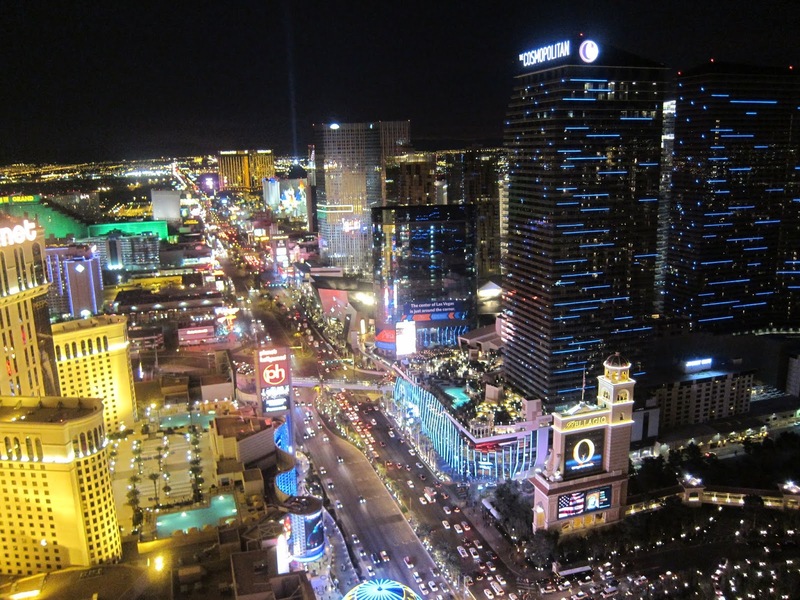 We decided to stay at Mandalay Bay and the MGM Grand, both on the strip (Las Vegas Boulevard), for the pools and so that we'd be near all the shows and restaurants we wanted to visit. If you're looking for a quieter, more family-friendly experience, however, remember that there are plenty of options off the strip as well. Here's a list of the best pools for kids in Vegas, if that's what your children really care about. A personal favorite Vegas activity of mine is the Fountains of the Bellagio. Every 15 to 30 minutes, the fountain comes to life and starts to dance to synchronized music and lights. It's mesmerizing to watch, and we always end up hanging out there for a couple of shows. The Bellagio's impressive Conservatory and Gardens is right nearby and also free. Vegas is home to several Cirque du Soleil shows, and we spent one evening watching the family-friendly one based on Beatles music, called Love. It was awesome. Here are all the Cirque shows in Vegas ranked in order of kid-friendliness. If we'd had the time to watch more shows, I'd have taken the kids to Blue Man Group (since they loved the one in New York) or the Tournament of Kings (because what kid wouldn't enjoy watching a jousting match while digging into a meal with their bare hands?). Here's a list of all the family-friendly shows in Vegas. 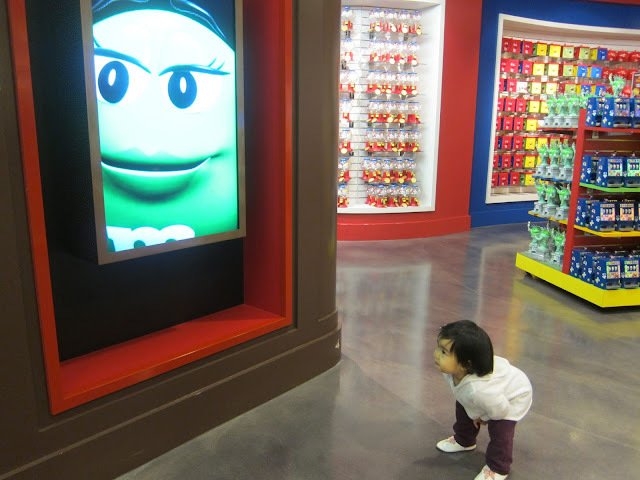 Kids can get in on the shopping action in Vegas with M&M World, four stories devoted to all things M&M. We didn't visit it with our kids this time around, but had taken our daughter there when she was a baby a few years ago. In addition to all the candy you can buy, there are interactive attractions like a 3-D movie there. Other kid-friendly suggestions: zooming up to the top of the Eiffel Tower at the Paris hotel (the photo below was taken from the view at the top), riding the ferris wheel at the LINQ hotel, taking a gondola ride in front of the Venetian, visiting the shark reef at Mandalay Bay, and checking out the amusement park rides at Circus Circus. Here's a more complete list of attractions for families. Vegas doesn't lack for dining options, so where you dine all depends on your tastes and preferences, but a couple of standouts that we enjoyed with the kids were House of Blues in Mandalay Bay (excellent food and service, plus kids eat free!) and Buddy V's Ristorante in the Venetian (best spaghetti and meatballs kid's meal ever). If you're able to sneak out for an adults-only dinner, or if you don't mind shelling out for a pricey meal with the kids, our absolute favorite place to dine in Vegas is Momofuku. The bo ssäm family-style dinner is one of the best meals I've ever had. As I mentioned, Vegas was just a quick stop before and after a week-long trip to Zion National Park and Bryce Canyon for us. I highly recommend visiting both parks with your kids; the hikes are super fun and memorable. Here are my posts for family-friendly hikes and activities to do at these parks.